The one game I won. It’s a cute fast game with light decisions. Tactical. I haven’t played this in a while. The game is fine, though there is more conflict than I like. Once someone gets ahead as Jon did, other players can’t catch up. He had the extra elephant special card, and had around 8 elephant and small chips so he scored a lot every round. I had the yellow card and got two points every round, but it wasn’t enough, and it cost me to play it. I couldn’t pass, and needed to focus on yellow chips to keep it, so was low on cards. Elad started the game with us, but then got called back to his hospital work for surgery. The score was 960 to 940 for both rounds before the end. I made 3 Tichus right off, it turns out I would have made GTs if I had called them with the 2 high cards I had each time, but that’s risky. Aaron missed two Tichus, he was weak, but mostly Jon had very good cards and a bomb, and called Tichu against him. Haim made and called a Tichu. We are back from vacation, although there was some game activity during our absence (or so the Whatsapp group informs me). I brought this back from the UK. We didn’t play any full games, just some practice rounds. I also brought this back from the UK. Al of us had played before, although apparently with a few confusions about rules. Haim did the nearly complete “no point” cards strategy, which eventually let him acquire three nobles and enough cheap point cards to eke out a win. I had no “no point” cards, although I usually have a few, and I was only a single round from winning. So I’m still not sure what the best approach is. Second play for CB, who looked like she might be leading a bit by the end of spring, but by the middle of fall it was clear that Nadine had blown us away and the question was by how much. She was the only one who had a fully functioning barrel production and point production combination, and, since no one else cared much about moving barrels, we didn’t act to stop her. Nadine also passed a lot in the third round to have enough meeples to move the barrels (she ended up with 21 barrels on one hex at 3 points each). Instead, CB and I fought over a few tiles that were worth points, but it was only a fight for second place. On the Whatsapp score, we forgot three points I had in gold barrels at the end, which made no difference. Nadine: We had both the 4 and 5 Movement tiles in play which hasn’t happened in the games I’ve played before. I thought our house rule of protected home tiles was in effect, but found out in Winter that it only applied when there are new players. It actually helped me, because I was able to move 6 barrels with 5 yellow meeples by using other home tiles, I didn’t have six of the same color left. I ended up producing more than I planned due to the Movement tile availability, I was planning on using my extra meeples to take more of the final scoring tiles. I sat with Noam and taught him how to play, and then let him play some of it (correcting him on occasion). Nadine or Haim had all the bombs and often all of the high cards. Nadine: I had almost all good hands, I only passed a high card once or twice. No one called Grand Tichu or defeated any Tichus. Rochelle is from Australia and comes regularly to our evening sessions. Gili, Emily and Eitan are regulars. Eliezer and Meir came from Beit Shemesh, Eliezer attends the group there, Meir is in yeshiva. Eszter is originally from Hungary and came a few times during the summer. Jake is a new oleh from Boston, he’s been here 3 weeks. Daphna is in ulpan, she made aliya 3 months ago from LA. She heard about us from Eitan’s mom. People arrived between 1:30 and 2 pm, and most stayed until 10:30. One additional person emailed for directions, which I didn’t see until the evening, but he could have called because my number was in the announcement that he had. My new neighbors who just moved here from Efrat combined their sukkah with ours, so we had a lot of space. And it didn’t rain, though it did get cold later in the day. We picked this as easier for a new gamer than Amun Re with the auctioning. Jake has played Settlers, but this was his first more complicated game, and it took him a while to understand all the different implications. Emily and Eitan were also pretty new to the game. There was a lot of fighting for everything, and a lot of duels. Last round Gili, Jake and Eitan had 10 cowboys. I managed to get the white cowboy only once, by passing early, for the third round, but that was enough to put me far enough ahead. I had the building discount card the first two rounds, which helped me because I had good buildings and income from the start, and third round the available buildings weren’t good and people didn’t buy many. This is the first time I understood how the surroundings work for buildings other than mines and ranches, I thought it was buildings and houses, but it’s actually only houses. Eitan robbed people’s income several times, Gili fought him but I didn’t, he took half of my 15 for a saloon twice. Everyone except me fought for the guns on the last round; I had used all my workers to get money third round so I went last and took the plot card. Gili played well but had bad luck in dice rolls, which Eitan had counted on. Overall people liked the game. Gili and Eitan played during a break. Jake left partway through but they continued playing. First play for Jake, Eszter and Daphna, who all enjoyed the game. Eitan said he understood and liked the strategy this time. Eliezer and Meir played when they arrived and we were still playing Carson City. 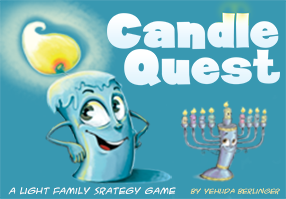 First play for Meir and Rochelle, Eliezer explained the game. Eliezer picked this and was teaching it as we were finishing Carson City, so I joined, and then Emily also did. There was a bit of confusion as we tried to start El Grande, finish and count points for Carson City, and select restaurants and order food. We tried a brand new one, Daisy where Shakespeare used to be, with mixed opinions, and some people ordered from Village Green. I wasn’t ahead until the end and didn’t think I’d win. Meir was ahead most of the game, with Eliezer catching up. Other people did things at the end which helped me, such as special scoring. My region was New Castille which I don’t like because it’s competitive and in the middle, but someone put the 4-0-0 scoreboard there which helped me because then everyone stayed out of the region. Until the very end, when two others went there from the castillo, matching my 3 pieces, and giving all of us 0. The scoring round before, no one challenged Meir in Granada because we all thought everyone else would go there, there was duplication in where we went from the castillo. Rochelle caught on and played well, but hurt herself by making her Old Castille region too competitive with the 9 point scoreboard. 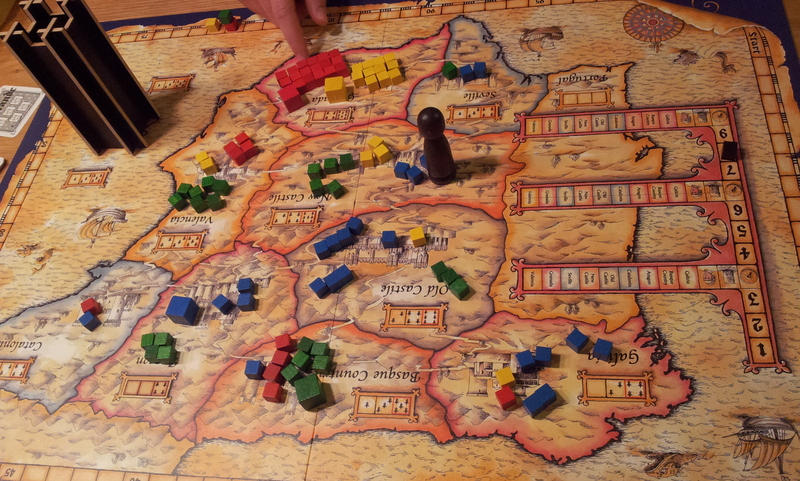 People put large numbers of pieces into the castillo, and then crowded small regions such as Aragon and Seville. Eliezer really liked my Jewish theming and pictures, he had played regular Ra. It was hard to get everything we needed. Eliezer took a large set at the end of one round, and Meir got the three items he wanted at the end of the game before the last auction tile. Daphna got this recently so we played a few cards after everyone else left. The wooden pieces are nice. Gili brought this. First play for Emily and Rachelle, and Eitan only played once. Eitan was ahead most of the game, Emily seemed to be doing well too. Rachelle caught on well and had the yellow two-point card half the game, but would have done some things differently if she had realized about the cards points at the end. I saved cards for 17 points, which wasn’t enough, I would have done better by competing more. Gili had 3 more cards than Eitan at the end so she won. I was ahead first round. We had a lot of fun with the tension at the end of the rounds. Rachelle was left last twice, once she took one tile, once 4, all before the last auction tile turned up. 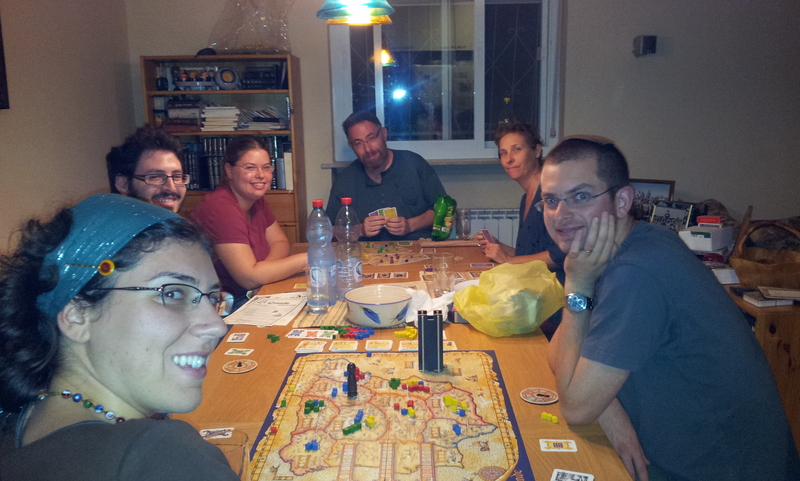 Emily and Eitan played Railroad Tycoon in Copenhagen last night, and saw real Ra game boxes. Next game night in two weeks.